CLX™ loudspeaker, the Theos features advanced XStat™ electrostatic technology and a proprietary Vojtko™ crossover topology delivering the highest sonic standards of efficiency and precision. A passive 8-inch high excursion woofer and ultra low turbulence down-firing bass port generate unyielding, detailed bass down to 43Hz. Custom coupling spikes and tool-less bi-wire binding posts provide the final touch—providing the ultimate level of flexibility for connection and setup. Sharing with its PoweredForce™ counterpart Ethos, a unique XStat™ transducer was developed to exclusively address specific mechanical requirements. Vertically identical in size and dispersion to the flagship Summit™ X, Theos’ thinner 9.2-inch (23cm) horizontal panel dimension required a tighter curve to achieve MartinLogan’s distinct 30-degree dispersion pattern. 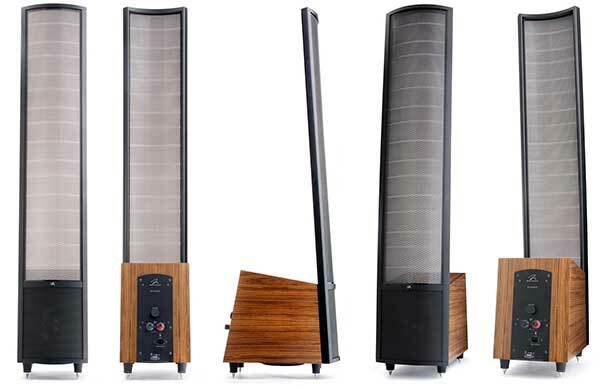 To accomplish this MartinLogan engineers reduced the gauge thickness of the steel stators. The reduced gauge does not alter performance characteristics of Theos’ electrostatic panel. However, as a natural byproduct of tighter build tolerances, visual transparency of the panel is increased significantly. Theos’ new XStat panel is so visually transparent that it nearly vanishes when you’re sitting and listening. Proprietary Vojtko filtering technology is utilized for Theos’ electrostatic transducer. This audiophile quality network, derived from the CLX, is carefully hand-built using precision point-to-point wiring, polypropylene capacitors, massive air-core coils, and a custom wound E-I core transformer—flawlessly preserving micro-acoustic subtleties while effortlessly handling the broadest range of dynamics contained within even the most demanding sonic source. MartinLogan’s proprietary tool-less binding posts simplify cable connection and management. Two sets are supplied—one connected to the electrostatic panel and the other feeding the woofer. 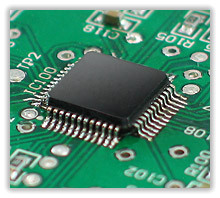 Listeners can choose to vertically/horizontally bi-amp the Theos, or use jumper clips between the binding post sets for a single wire-connection. Theos features bi-wirable binding posts and provide the ultimate level of flexibility for connection and setup. To further simplify setup and cable management, the Theos features a low-voltage DC power supply eliminates the need for a traditional, heavy IEC power cord. Martin Logan is proud to announce an advanced combination of sonic technologies establishing an unprecedented new direction for audiophile design. Descended from Martin Logan’s renowned CLX™ loudspeaker, the new Ethos features advanced XStat™ electrostatic technology and a proprietary Vojtko™ crossover topology delivering the highest sonic standards of efficiency and precision. An immensely dynamic 8-inch PoweredForce™ woofer and 8-inch passive radiator duo utilize an innovative 24-bit Vojtko DSP (digital signal processing) Engine and powerful 200-watt class-D amplifier to generate effortlessly detailed bass down to 34Hz—from an extremely compact design! A unique XStat™ transducer was developed to exclusively address the specific mechanical requirements of the Ethos. Vertically identical in size and dispersion to the flagship Summit™ X (and taller than the Vantage), Ethos’ 9.2-inch (23cm) horizontal panel dimension required a tighter curve to achieve Martin Logan’s distinct 30-degree dispersion pattern. To accomplish this Martin Logan engineers reduced the gauge thickness of the steel stators. The reduced gauge does not alter the performance characteristics of the Ethos’ electrostatic panel. However, as a natural by-product of tighter build tolerances, it does increase the visual transparency of the panel. Ethos’ new XStat panel is so visually transparent that it nearly vanishes when you’re sitting and listening. Ethos is available in 3 hand-rubbed, real-wood finishes; black ash, dark cherry & teak*. * Our real-wood, highest grade Teak finish varies in colour, figure, and texture, with no pairs looking exactly alike, making each set we manufacture unique. Photos shown should only be considered an example, reflecting Teak’s beautifully natural, variable and complex character. Martin Logan’s dedicated in-house design & engineering team wanted to pack as much bass performance as possible into a sleek, compact design without compromising the detail, speed, and transparency required to keep up with our agile electrostatic panels. To accomplish this Martin Logan designed an extremely precise 24-Bit Vojtko DSP Engine in conjunction with a powerful 200-watt class-D amplifier to harness a stunning low-level performance—uncommon in cabinets this compact. Proprietary Vojtko filtering technology is utilized for Ethos’ electrostatic transducer. This audiophile quality network, derived from the CLX, is carefully hand-built using precision point-to-point wiring, polypropylene capacitors, massive air-core coils, and a custom wound E-I core transformer—flawlessly preserving micro-acoustic subtleties while effortlessly handling the broadest range of dynamics contained within even the most demanding sonic source. Ethos’ 24-Bit Vojtko DSP Engine and 200-watt digital amplifier create powerfully detailed bass from a custom designed front-firing 8-inch aluminum-cone PoweredForce woofer and precisely matched down-firing 8-inch passive radiator. This unique radiator enhances bass output, much like a port, but without port induced noise and midrange resonance. Ethos’ passive radiator utilizes a full woofer suspension design to achieve maximize linearity during massive excursion. Additionally, Ethos’ proprietary intelligent DSP engine allowed our engineers to utilize a smaller-than-average passive radiator to obtain the appropriate level of bass performance required to flawlessly blend with the electrostatic panel while still maintaining a minimal footprint for the cabinet. Low Frequency Transducer 8″ (20.3cm) cast basket, high excursion, aluminium cone with extended throw drive assembly, non-resonance asymmetrical chamber format. 8″ (20.3cm) cast basket, high excursion, polypropylene cone passive radiator. Components Custom-wound E-I core transformer, air core coils, polypropylene capacitors. 24-bit DSP based pre-amplifier (used with woofer amplifier). The ElectroMotion ESL (EM-ESL) represents a brave new direction for electrostatic loudspeaker design. Featuring a full-sized 34-inch tall curvilinear XStat™ electrostatic transducer the new ESL performs more like a mini-flagship than an entry level audiophile speaker. 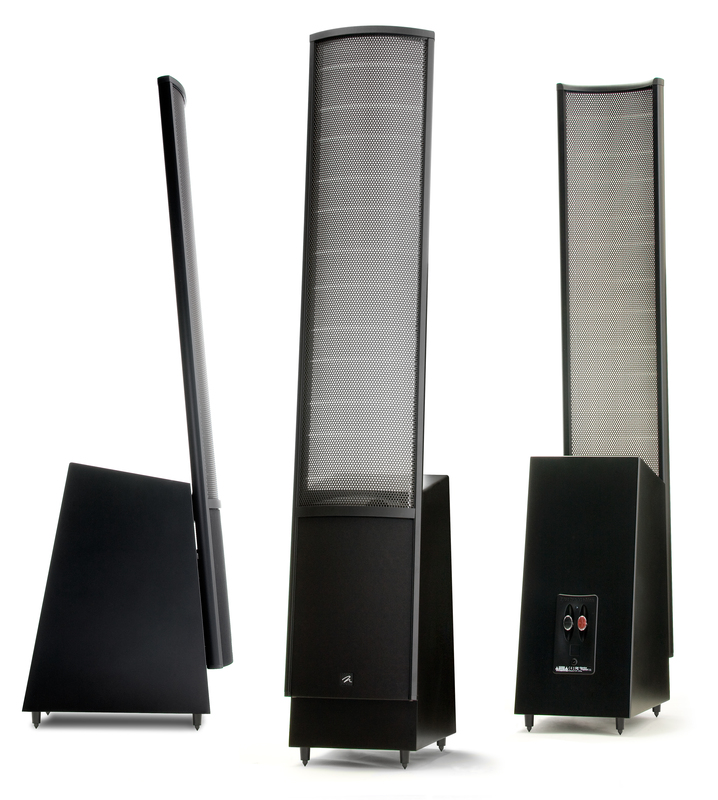 Long time Martin Logan enthusiasts are sure to describe ElectroMotion ESL as the second-coming of the legendary Aerius electrostatic speaker which debut in 1992 and went on to sell in record numbers. The new ESL, however, boasts 40 percent more radiating surface, a superbly integrated and authoritative bass performance, and a sensitivity rated at 91dB. In addition, the ESL is capable of being effortlessly powered by both receivers and high-end amplifiers alike. ElectroMotion ESL‘s XStat electrostatic MicroPerf panel is housed within a radical aluminium and composite AirFrame™ similar to those found on MartinLogan’s flagship products. AirFrame technology rigidifies the electrostatic panel without obstructing playable surface area or interfering with ambience enriching dipole sound radiation. At the same time, an AirFrame provides electrical and acoustical isolation, minimizing inter modulated distortion caused by vibration and resonance while enhancing imaging, low-level sonic detail, accuracy, and efficiency. MicroPerf design optimizes the individual holes of The EM-ESL‘s electrostatic panel. MicroPerf design substantially increases diaphragm radiating area, compared to early generations—without compromising structural integrity. The resulting increase in output capability and efficiency allows The EM-ESL‘s panel to enjoy a substantial leap in bandwidth and dynamics without growing larger. For example, The EM-ESL‘s XStat electrostatic panel features 129 square inches of sound radiating surface on both the front and back and a sensitivity of 91dB into 6 Ohms. The Aerius, well received its day, only had 93 square inches and a sensitivity of 89dB into 4 Ohms. 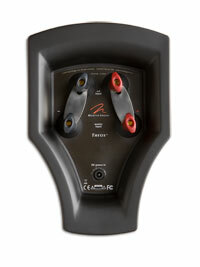 A unique XStat™ transducer was developed for the ElectroMotion ESL to reduce the gauge thickness of the electrostatic panel’s steel stators. The reduced gauge does not alter the performance characteristics of the panel. However, as a natural by product of tighter build tolerances, it does increase the visual transparency of the panel. The EM-ESL‘s new XStat panel is so visually transparent it nearly vanishes when you’re sitting and listening. One of MartinLogan’s original breakthroughs, CLS™ (Curvilinear Line Source) technology, has been an essential ingredient of every electrostatic loudspeaker we’ve produced—and the ElectroMotion ESL is no exception. Proprietary manufacturing methods enable construction of electrostatic panels as cylindrical sections. Their gentle horizontal curvature solves the problem of obtaining good high-frequency dispersion from a large radiating surface without compromising overall sound quality or reliability. Nominal Impedance 6 Ohms, 1.6 @ 20kHz. Compatible with 4, 6 or 8 ohm rated amplifiers. Introducing Crescendo, a powerful and precise premium wireless speaker system, featuring dual audiophile quality Folded Motion™ tweeters and a 5×7-inch mid/bass woofer for a deep, extended bass response. The Crescendo is capable of reproducing sound with unflinching accuracy, resolution, and detail—the inspiration behind every Martin Logan design. Our dedicated in-house design and engineering team created the ultimate table-top speaker system in a sleek, compact design without compromising sound quality. Taking a “no-compromise” approach, the Crescendo features premium construction and design elements not typically found in similar speakers. 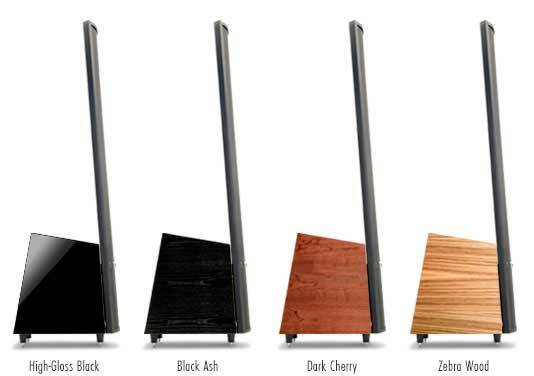 MartinLogan has always blended Science with Art, and the Crescendo is no exception. Designed to fit a modern decor, Martin Logan utilizes high-quality materials and finishes to give Crescendo a furniture and artwork like appearance. The result is striking. The dense cabinet enclosure, wrapped in either high-gloss piano black paint or real-wood walnut veneer, floats atop a sturdy aluminium stand and looks comfortably at home in any decor where aesthetics are as important as sound quality. A cleanly integrated, front mounted control panel allows quick access to power, input and volume controls. For across the room control, Crescendo includes a custom remote control built from black anodized extruded aluminium. At the core of the Crescendo is an advanced 24-bit 48kHz DSP (digital signal processing) based pre-amplifier in conjunction with a powerful class-D closed-loop 100-watt (140-watt peak) amplifier. Crescendo’s amplifier creates powerfully detailed sound from a custom designed front-firing 5×7-inch matte black polypropylene cone woofer with extended throw drive assembly in a non-resonant asymmetrical chamber format. Low frequencies are seamlessly blended with two of Martin Logan’s high-performance Folded Motion™ tweeters for an astonishing, room filling experience. Stage X is the world’s most advanced centre channel speaker, incorporating a state-of-the-art XStat™ electrostatic panel, Folded Motion™ tweeter, twin 6.5-inch aluminium-cone woofers, and highly sophisticated Vojtko™ crossover. What really sets the Stage X apart is a innovative Folded Motion tweeter embedded directly behind the XStat electrostatic panel in a unique housing that gives the visual look of a seamless electrostatic panel. By eliminating the need for a bulky tweeter-housing mounted in front of the ESL panel, the Stage X all but eliminates high-frequency diffraction. This unique mounting system also increases mid-range/high-frequency phase coherence and time alignment while offering superior dispersion characteristics. Folded Motion tweeter technology proves an ideal match for the electrostatic transducers, providing lightning fast transient response combined with a large surface area (8-times that of a typical 1″ dome tweeter) to create clear, dynamic and precise sound. Advanced MicroPerf stator technology dramatically increases the sound-producing area of Martin Logan’s latest-generation CLS™ electrostatic transducer. This increase in effective radiating area translates to higher efficiency and an even more effortless, unlimited dynamic presentation. The XStat pulls no punches! But there’s more to it than just putting more holes in the stators, which must maintain uniform spacing in front of and behind the diaphragm to exacting tolerances. They cannot flex. Stage X firmly anchors the transducer’s working elements—stators and diaphragm—around their periphery, while ClearSpar™ spacers stiffen the assembly. ClearSpars enable precise, consistent tensioning of the Vacuum Bonded diaphragm without obstructing the floating, see-through look that is the visual hallmark of Martin Logan electrostats. In the end, a speaker cannot outperform the signal feeding it. Martin Logan’s state-of-the-art transformer and electrical interface engineering ensure an absolutely transparent link from amplifier to electrostatic panel. The result is sound of unparalleled purity, precision, clarity, and openness—the next best thing to no speaker at all. An easy to install, low-voltage DC power supply eliminates the need for a traditional, heavy IEC power cord and increases installation flexibility. Martin Logan’s proprietary tool less binding posts make cable connection and management a breeze. Each speaker also includes a single-pivot bracket/stand that enables easy installation on a set-top, shelf, horizontally/vertically mounted to a wall (under or beside a plasma screen, for example), or resting on a floor. By eliminating cone flexure, aluminium diaphragms help our advanced-technology woofers achieve the very low distortion necessary for proper blending with Martin Logan electrostatic panels. Carefully hand-built using only the finest polypropylene capacitors and air-core coils, the crossover employ’s Martin Logan’s proprietary Vojtko topology for vanishingly low distortion and seamless driver integration. This precision-tuned network preserves even the most microscopic sonic nuances while handling the full dynamics of any source.